Collagen is the fibrous structural protein that makes up the white fibers (collagenous fibers) of skin, tendon, bone, cartilage, and all other connective tissues. It is also found dispersed in gels of the body to provide stiffening, such as in the vitreous humour of the eye. In other words, collagen is the natural protein that composes most of the body’s structural support and is the primary substance of connective tissue. It is the fibrous connective tissue that holds our body together. Collagen is present in all multi-cellular organisms. Collagen gives the different organs and tissues their strength and elastic properties. Twenty-five percent of the dry protein weight of the human body is collagen. Seventy-five percent of our skin is made of it, and in total – some thirty percent of our entire body is collagen. Collagen is part of the natural make-up of tendons, ligaments, joints, muscles, hair, skin, and vital organs. • Arthritis: In order for osteo-arthritis to be treated effectively, the cartilage and synovial fluid in the joint must be protected against further destruction. Collagen protects and restores joint cartilage by supporting or enhancing the synthesis of synovial fluid, which is required to lubricate the joint. It also inhibits free radical enzymes and auto immune processes that degrade joint cartilage and removing blockages in blood vessels leading to the joint. Collagen proteins helps the body to rejuvenate naturally in order to regenerate cartilage and healthy joint function. ageing and trauma disrupt the body's ability to use its own chondroprotective agents, which has led to an epidemic of arthritis throughout the world. • Anti-Ageing: The body’s production of collagen slows dramatically with ageing. This slowing process is stealth-like and rather insidious. It starts slowing in our mid-twenties, picks up speed in our thirties and forties, and the losses are even more pronounced through our fifties and sixties. Lack of collagen, or the body’s improper use of collagen, is what causes the ageing process. Besides its many structural properties, collagen serves as the major catalyst for growth and repair of nearly all the body’s tissues. Many different ageing diseases are related to the body’s supply of this vital protein and to disorders in the collagen itself. What scientific studies give evidence to support Collagen's action? Clinical trials have shown that Type II Collagen reduces inflammation. In one double-blind placebo controlled study, 60 patients with severe rheumatoid arthritis took this collagen for three months and experienced a 30% reduction in joint swelling and tenderness. The results of a survey by the Medical Clinic of the University of Wurzburg, Germany in 1995 shows that the long term consumption of Collagen increases the stability and resilience of protein structures. This in turn leads to an improvement in the quality of brittle fingernails and improvement in the quality of hair. Tests carried out by Harvard Medical School have shown that 100 per cent pure collagen feeds and supports connective tissue. The results of research by physiologists Dr Oesser and Professor Seifert of Kiel University, published just two months ago, showed for the first time that collagen plays an important part in the nutrition of cartilage tissue. The work of Professor R Moskowitz, director of the Arthritis Institute of the University of Cleveland and president of the International Osteoarthritis Research Society offers further evidence of the effectiveness of collagen in the treatment of osteoarthritis. Moskowitz’ research has shown that collagen resulted in a significant reduction of pain and an improvement in joint mobility for people suffering from osteoarthritis. Other Ingredients: Hydroxypropyl methyl-cellulose, vegetable magnesium stearate. Take one capsule at bedtime on an empty stomach with a large glass of water. Warning: Do not exceed recommended dose. If you are pregnant or lactating, consult a health care professional before using this product. KEEP OUT OF REACH OF CHILDREN. Store in a cool, dry place. Do not use this product if the safety seal on the bottle is broken. Since I have been taking Collagen, my joints aren't as stiff and I have less pain now. I wouldn't be without it! This is the first time I've tried using Collagen. I have osteo-arthritis with its accompanying joint stiffness and the well known signs of ageing - that include happy laugh lines as well as crows' feet.It's hard to tell how much can be attributed to the inclusion of a new dietary supplement and maybe it's the warmer weather and the new skin serum but I have to admit to being pleasantly surprised by a lessening of joint pain and sagging skin- so maybe this is a new lease on life? It's definitely worth a try. The Biovea Collagen capsules are fine. I have tried other brands and these are as good as any. I credit then with helping to reduce and even cure some arthritis, along with some other medication. I plan on continuing to take them. I am a fit and healthy 76 year old male in country Australia. I've been taking collagen for about 4 years for arthritis in my fingers mostly. The symptoms haven't completely gone but have definitely eased. I have much less pain and the burning sensation has greatly decreased. So far, it's the only thing that has helped my symptoms. We have been usimg your collagen caps for 6 months now with seriously good improvement to both of our spinal problems, some of which were serious issues. The collagen appears to be responsible for building up the disc cartilage and relieving back pain.We had been so impressed we have been recommending this to several of our friends and family and so many are trying the collagen caps that we jokingly comment that you had better keep your stocks up, we note that our latest order was shipped directly from the USA ! I have been taking collagen for 7 years now and after about 6 months found that I could kneel on my shins again and I could sleep all night with out waking up with pain in my shoulders, knees and hips.These benefits are on going consequently I am enjoying life more. I will keep taking it! 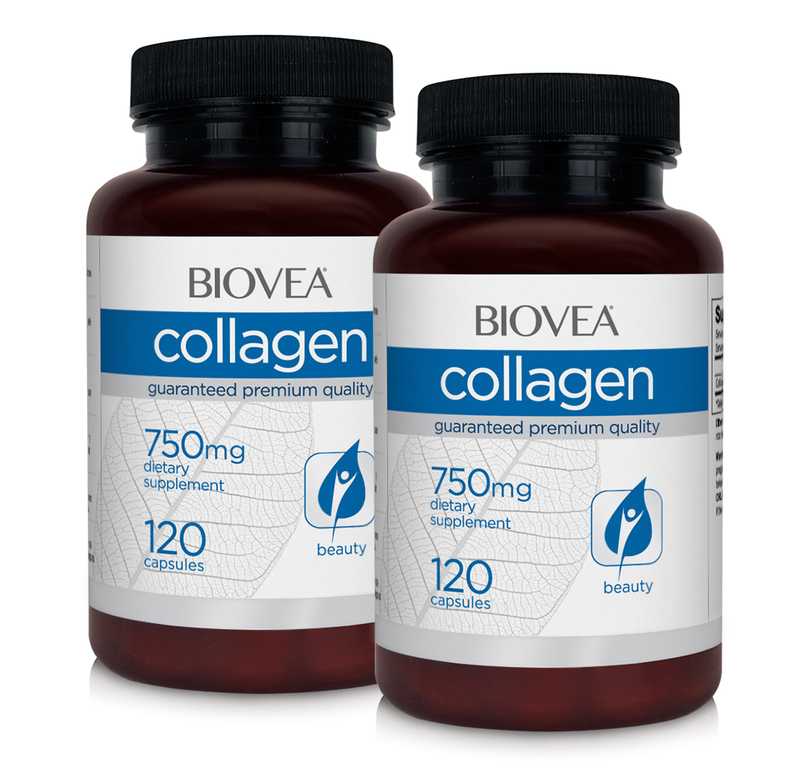 My husband and I both have taken Biovea Collagen 750mg capsules daily for several years. We find it assists with joint problems - hips, knees and arthritis in mature years and has the bonus of boosting healthy hair & nails. Love the product and find it easy to take & digest. I have been using this product for 2 weeks now. I do get the impression that the sagging around my eyes is less. I seem to look less tired. I ordered this because I saw a friend for the first time in 10 years & she looked younger than when I saw her last. I asked what her secret was. Seems she was just eating healthily & using this product. Gets 4 stars rather than 5 because you are supposed to take it at night & it lies heavy in the stomach. This product is beneficial for your overall health, particularly for joints and connective tissue. The Collagen value pack is very good; however, the value pack of Collagen and Hyalluronic Acid is better.